I would think starting off with easier shapes to work with, like rectangles, would help. But then the exact question is too easy (“cut it in half, so you get same size squares”). So modify that a little: You’ve got a rope 12 inches long. Cut it into 2 pieces and make a rectangle out of each piece. Where do you have to cut it so that the bigger rectangle is twice the size of the smaller rectangle. Once you’ve got that idea down, you can change the shape to square and circle, or equilateral triangle and circle, or what have you. Great problem, and interesting to think about approaching. It would be cool to use some geometry software like GSP (Geometer’s Sketchpad) to help students play around with the idea and think about it. I made a GSP file… but I’m not sure if it represents the situation accurately. I’ll email it to you so you can take a look. My first thought is that a visual representation will go a long way toward nudging the students to a place where they can begin to construct a model. I visualize this as soon as I read it. I know many of my students will not. The size of your problem depends on the goal you want to reach with students doing this exercise. Is it the start of something new? Is it to test if they understood what they’ve learned before? …? More questions instead of answers… Maybe not very helpfull. Sorry for that. The need to change the language would depend on what a particular class of students is used to – more “everyday” language vs. more “mathematical” language. Visual aids would be helpful in the beginning, Geogebra after the students worked a little with it first. You have a string that is 36 cm long. Choose somewhere to cut the string into two pieces. Make a square out of one piece and a circle out of the other piece. Which has a bigger area? How much bigger is it? Now switch pieces – make a circle out of the piece you made a square from and a square from the piece you made a circle from. Which has a bigger area? How much bigger is it? Cut the string at another place and do the same thing again. Is there somewhere you can cut the string so that the circle and square will have the same area? I have been given a certain length of ribbon. I want to cut the ribbon into two pieces to make (outline) two shapes, a circle and a square. I want the shapes to have equal areas. Where should I cut the ribbon? Dan, I envision you creating a little video to show the active nature of this problem – you sitting at your table cutting ribbon and trying to make circles and squares from the pieces. The problem you present is a classic example of how we can make math problem linguistically challenging by an over reliance on static or nominalized language. When we make it active, it opens it up to more students. I have actually written about the need to “Verbify” mathematics in a “For the Learning of Mathematics” article which you can download here: http://showmeyourmath.ca/sites/default/files/02-Borden.pdf. Feel free to share. A rancher needs to build two new corrals for his cows. Each is to contain 100 cows. He gives the job to his two sons, Joe and Wayne. Joe makes a square corral and Wayne makes a circular one, and between them they use 400 yards of fencing. How much fencing did Joe use? At least this version is more practical (slightly!). The difficulty with the mathematical description of the problem is its static nature. The ‘line segment AB’ bit is designed to muddy the problem. Once one sees that a piece of string is what is meant the difficulties vanish. How about putting a square on the line at one end and a circle of the same area at the other end, rolling them towards each other by one full turn and seeing what you get (a gap which can be thrown away or a change in the area, so that the objects meet, at a sensible point of course). Also, the problem as given is as artificial as some of the worst ‘Word problems’. Clearly designed for students who are already ‘into’ math. Here’s my attempt at working through the problem with my older son this morning. Great problem (and I’ll be editing my blog post when I have some free time later today). I wonder if it goes too much towards removing the need for students to make sense of the language. Maybe as a support? Encourage you to read Mike’s take on the problem with his kids. It seems to me that many of the responses miss the point of the exercise. If we want students to solve challenging exercises, we should not seek out ways to make the exercises easier; rather, we should seek ways to encourage the students to come up with their own means of addressing them in their pristine form. We want them, not us, to generate the interesting ways cited by responders of exploring the problem. So I played around for an hour and created a simple visualization for this problem, that given the proper guidance, kids could easily construct themselves using Etoys. Which in addition to the “important mathematics” listed in 1-6, would add item 7 Computational Thinking (using computers to think and model with). My first question was “Why would a kid want to do this in the first place?” As a math geek (most math teacher seem to be math geeks) I think the question looks fun. Most kids are not math geeks. Gerry Rising has the point on a problem like this. Put it to the kids to make it interesting. 0. If the length of AB is 1, what is the length of AP? 1. What is the ratio of AP to PB? 2. Given Ps, the perimeter of a square, what is the area of the square? 3. Given Pc, the perimeter of a circle, what is the area of a circle. 4. How would you express “the two areas are equal” algebraically? That’s just off the top of my head. I see a gap already been 0 and 1. Here’s a desmos (not graphed, just sliders) representation of the problem. I get something close to : 53.0165/100 towards B by playing around with the slider. I like the idea of the Geogebra applet but it’s also important for students to look at general cases in higher level courses. The geogrbea applet could be misunderstood as “the answer” by students who do not know the meaning of “arbitrary” and the possibility of multiple answers. I am surprised at Dan’s correct 4-digit accuracy by such a means. And here’s the desmos with visuals and a draggable point. I also jumped straight to the technology to make a simulation (on GSP). If I were to do this with my class, I think that, as Eddi said, I would use rope. Give each pair of students a piece of rope or string and a pair of scissors. Give them the problem and challenge them to find the maximum area for a square and a circle. Go from there to the technology (GSP, DESMOS etc.) and the more formal algebra. My first question was: What is the ratio of AP to PB? That way we could know where P is for any length of AB. 1. Here’s the updated version with overlapping square and circle, and hashes to represent side lengths and radius. 2. Just drag the point, or type a number into the slider. 3. Click the wrench to show/hide gridlines. I have a comment re: use of the word “form” here. Substituting “is equal to” makes the meaning more clear for me- is this reducing the required complexity/ use of mathematical language? Another point – Why does the problem formulation have names for the points. This gets in the way. Pick a point on the line. Make a square from the piece on the left. Make a circle from the piece on the right. Will these have the same area? The question as originally put should now scream at you!!! Your Geogebra is also very good. 2) When would you want (and NOT want) the kids to construct their own models. 3) Challenge: Can you make a version where they find the answer via a series of successive approximations? Say where they pick the middle of the segment then can decided Left or Right and go half way each time until they get "close enough". I’d say Howard Phillips has nailed it perfectly when it comes to lowering the barrier to entry and by getting the kids to pose the question you want them to answer. At this stage no tech is necessary, just a board and a marker. I think I’d only use tech in act3 to show that their answer looks right. Read the question this afternoon and did a little GeoGebra doodling as a means of getting students to understand the question without giving the answer. A great part of learning math is learning how to read, and visuals can only help this process. Or about a 53/47 split. I too went quickly to a visual model, using Geometer’s Sketchpad. Because Sketchpad, like Geogebra and Desmos and ETools(?) is a geometric construction tool, I ended up with a square and a circle based on the measurements of AP and PB, both of which kind of hang out at the end of the line. The whole time my brain is going “can’t the line kind of wrap up to make the square and the circle?” but because I couldn’t model it that way with my tool, I couldn’t see the interpretation of using part of the line (or rope, or ribbon, or whatever) to physically form the circle or the square. Gerry wonders if our goal is to get the kids to do the problem or to get them to translate the precise mathematical language… and if it is to get them to translate the language, what we would do then. If the goal is to get kids to do the math, I really like the simplicity of having some rope and asking kids to make guesses about where to cut the rope so that a circle formed from one and a square from another have equal area. It lets them get into the problem, make some guesses, test possibilities, and will require them to set up the exact same algebraic expressions to eventually solve the problem. This also lowers the cost of entry by a LOT. Any kid can point to a spot on a rope. Very few kids can start working on expressions for area in terms of PA/AB (or whatever it is y’all did to solve this). But… if we do all the interpreting for them, then we will have kids who can solve real problems that they define for themselves, and any problem interestingly posed, but who will look at dry old mathematician talk and turn up their noses. And I DON’T think that the reason kids should learn to read problems like this and get to work is because they’ll have to on tests. That would suggest that there’s no other reason that precise language might be important in math. I think there are good reasons for precise language and students should encounter those reasons. I also think we learn to read by learning to write, often. So I would have my students solve the problem as a rope-cutting problem. Then I would invent or find a mathematical pen-pal and have them try to pose the rope problem to them. Think of the Writing Instructions for a Peanut Butter & Jelly Sandwich task so beloved by math & science teachers. This pen pal would come back at them with questions and non-answers until they had mathematized the problem as selecting an arbitrary point P on line AB of arbitrary length, forming a square whose perimeter was equal to PA and a circle whose circumference was equal to PB, such that the areas enclosed by the circle and square were equal. Such nitpicking might include wondering what it means to “form a circle from the rope” or why you couldn’t just measure the length of the rope or how a rope could have area, or whether you could cut the rope along its long axis, thus making two long, skinny pieces of rope, etc. The point of modeling with math is to be able to abstract away those pesky real-world details that get in the way of solving a reasonable version of the question… and I’d want my students to experience that kind of writing, so they could begin to make sense of that kind of reading. I’ve never tried this so I don’t know how it would go, but I could imagine some version of it leading to frustration but also insight. (1-sqrt(pi/4))/(sqrt(pi/4)-pi/4)=1.129. I teach AP Calculus BC and find that what students struggle most with in Calc is the Algebra. This problem really stretches those skills. I am going to use this problem in my Calc classes next week. I plan on presenting it just as it was here and then have the students cut various lengths of strips of paper to try to get the areas to be equal before they attempt the algebra. If I read the post, it seems to me that the question is “How do we teach/ensure that the language is understood? At some point, a child will not have someone who will simplify the language. They can only model the problem on their own IF they can understand the question. I’m just a parent, but it seems to me that the first thing would be to ascertain comprehension. Get a highlighter, underline key words. Encourage them to look up definitions. The using those words, illustrate or model the problem. Draw a diagram. If you can’t get past that point, then finding the right formula is going to be a challenge. My son is younger, but we’ve been trying to use math language in daily language and find ways for him to retain the meaning. For example: Perimeter …”Secure the perimeter!! !” As in the distance around the object. Which as a typical young boy, he relates to. Personally, I always found working through math questions it helped to read it once all the way through. Then read it a 2nd or even 3rd time. Draw the diagram one phrase at a time. TMI to retain all that in short term memory. I feel, at least with my kid, that they feel they should get it the first time through. Not sure math is like that. It’s okay to re-read, ponder and draw. I should clarify that I started with a circle and square with congruent areas. I used 36. So the perimeter was 24. I solved for the radius which was 6/(sq rt pi). Circumference then is 12*(sq rt pi). Compare the two lengths [24 : 12*(sq rt pi)] and this simplifies to the ratio I listed above: 2 : (sq rt pi). I ran this by other math teachers and at least one of them used quadratics to get there. I thought this was fascinating, but he was fascinated that I started with the shapes. He called that “working backwards” but it was just the way I naturally came into the problem. I’m going to be Downer Debbie here. This problem doesn’t do it for me. I looked at it using technology and came up with an answer, but didn’t feel that this answer helped me understand the “story” behind the problem any more deeply. I then solved the problem algebraically, but was once again left with a feeling of “ok then” versus “whoa.” I wasn’t surprised by the answer. Using technology, I didn’t find a “simple” answer that just screamed “something else must be going on here” or “there must be a simpler solution.” There aren’t any variations that I am yearning to solve. I’m not sure how a student might use this to explore a new concept or idea. Every visual representation I thought up missed the mark in relating the length of the lines and the “perimeters” of the shapes. So I wasn’t going to post this comment. I didn’t want to come across as rude or mean, the person yucking other people’s yum. But then I realized this was silly. The fact that this problem didn’t inspire me doesn’t mean that Dan’s an idiot simpleton because it DID inspire him. On the contrary, it’s a great reminder that there isn’t a quick answer to what makes for a good problem, and this answer isn’t the same for everyone. Thanks for the challenge and prompt, Dan. Looking forward to see what everyone turns out. The obvious extension is an equilateral triangle vs. a circle. I put this off for a bit, due to grading (Argh!). If I make an interactive visual model (my first instinct) I am depriving them of the opportunity to create their own models. If I give them concrete numbers (The line is one meter long) I eliminate a lot of the value of the problem. Following that, it’s a matter of scaffolding their modeling (CCSMP #4!) encouraging (CCSMP #1!) them to climb the ladder of abstraction (CCSMP #2!). I’ve got a dead day at the end of this week. Maybe I’ll try this then..
Mr. K, the idea of only one piece of string and only one chance to cut is nice because it makes the concept of “an arbitrary length” meaningful. You won’t tell them the string length in advance, they need to be prepared for any length. Cool! It asks a simpler question, without doing the work for them, and in answering it they’ll be developing some of the components of the model they’ll need to use later. Vary interesting comments. As Don Small probably battled his whole career teaching cadets at West Point, mathematics is only about modeling, even the arithmetic we put on the paper lest we forget what makes us happy to do. I’ve been reading some of the comments and I really don’t think that one should add a real/fake context such as a ribbon, a corral or any of the kind. I do think, on the contrary, that purely mathematical questions should be presented to the students once in a while, so that they can appreciate them “for the sake of it”. I find the problem appealing and I resent the idea that “most” kids won’t find it so. That being said, the difficulty of the language on which the problem is stated is of course an obstacle. My first idea was also to go to Geogebra and make a visualization, but I still thinks would struggle with the idea of “make a circle out of it”. I imagine that most of my students would misunderstand its meaning with “make a circle using that as its radius/diameter”. The same applies with the square and the perimeter: my first thought was that AP was the side of it, not its perimeter. 1. Draw a segment AB and a point P on it. 2. Draw a square using AP and a circle using PB. 3. Is it possible for the the square and the circle to have the same area? If so, where should we put P? Start with a real world problem (fake if you like). Get an answer and check it for reasonableness. Finally, maybe as a separate activity, figure out how to present the problem in mathematical fashion, ie abstraction, use of technical terms etc. This way the students will have a much better idea about how to deal with problems already formulated in abstract terms. Oh, and mathematicians (and engineers) do not happen upon precisely formulated abstract problems and then solve them, they do more or less exactly what I have described above. Also they don’t spend hours trying to prove theorems unless they are convinced that the theorems are true. The problem as presented is really only suitable for math specialists, and as such quite a nice one. The biggest thing that stands out to me is what does it mean to “find P” – P isn’t a point with coordinates, it isn’t a fixed distance from A, etc. What we are really after is a ratio between 2 lengths, and the problem doesn’t make that clear. If I were posing the problem to kids, I would make the question itself much simpler and concrete: Here’s a piece of string. You are going to cut it into 2 pieces so that you create a circle and a square that have the same area. Setting it up, I would want to establish with the students that chopping it in half makes the circle bigger than the square, and ask why. Then I would ask them to take a guess, and then begin exploring. Each group would only get one piece of string, which would require them to compute the area in terms of the perimeter, rather than experimenting with cutting. I think a lot of commenters want to use Geogebra or something here, but I’m not sure that gives a satisfying answer, because it’s necessarily approximate, and not based on manipulating the formulas. I would ask kids to do this totally by hand. Some might make successive approximations (what if I do a 60:40 split, 65:35, etc) until they have it, but the challenge of having to do it by hand may motivate them to think about it w/ algebra. Great problem, not great set up. One, I’ve summarized, condensed, and responded to a lot of your commentary at this link. Two, I’ve added several resources I’ve created which I hope will serve less to dampen debate and more to toss a few dry logs onto the fire here. Dan, you’re a visual wizard. I was making my Sketchpad sketch in the hopes of making a wordless presentation of the video* but I couldn’t figure out a way to suggest how the location of P was building the circle and square. With your video, I would present the task wordlessly first, using videos 1 and 2 (or 1 and 3? Or 3, 1, and 2?) and then introduce the precise language once we had an intuition and played the “stop me when they’re equal…” game. But… I’m also not convinced that the video adds much that the rope doesn’t… depending on what language game we’re playing. If my students understand the rope as a physical stand-in for a math line, just like the pixels on the screen are a physical stand-in for the math line, then I don’t see any difference. If they take the rope too literally, then we’ve changed the task in subtle (maybe important, maybe not?) ways. *Having students make their own sketch felt like one of many problem-solving methods students might use, and not one I’d want to enforce or say is “the” way we’re going to make sense of the problem. It’s part of the solving, not part of the sense-making. I can’t tell – do you think new work a good thing or a bad thing? To me it feels like it’s a byproduct of trying to make the problem more accessible without actually making it easier. In that sense, I’m okay with it. It wouldn’t be too hard to throw together a javscript app that presents a line on screen and the students can click (drag?) on a point anywhere on the line. The line would then break and form a circle and square with the two pieces. A few questions on whether it is worthwhile and if so some of the details. 1. Difference between Dan’s video is the students get to play with where the points go, so the intro is more interactive. Is this helpful or not? 3. How much information should it give? This could in theory be controlled by the teacher in some way. 4. Could just give relative sizes of the shapes. For example, “the area of the square is 5% bigger than the area of the circle”. 5. Or it could give some kind of actual value based on an arbitrary line length. 6. Options to show a grid in the background for estimating relative sizes. 7. Options to add numbers to the line – or, possible to have an optional box where students can type in a fraction instead of clicking for where the dot will go when they feel ready to try and be more precise. 8. Teacher controlled options to show the calculations being done to find the two areas. 9. Options to change to other polynomials (makes the programming a bit more complicated, but maybe not overly so). 10. If allowing for a range of polygons, perhaps a table listing the percents based on number of sides and watching them get closer and closer to 50% as the number of sides increases (I did this for fun in excel, and was personally surprised at how fast it started to converge). Oh, and Dan, a small personal recommendation for your video – when you have the lines being “sucked up” into the circle and square, you leave behind a doted line to show where it was, but that is no longer there. I would really recommend changing the color of this dotted line so it is no longer the same color as the original line it is replacing. Possibly the same relative shade but much darker so the difference it more clear. It was kind of hard at first to see what was happening. I think a color change would make that stand out a lot more. Just my 2 cents. When you say you’re curious about my rationale for my redesign, do you mean you have questions about it, or just that you thought there was something interesting about it? Left unsaid (my fault) was that only the first question is offered up front, and that is for the gold medal (or whatever). The next question/hint must be requested, and that drops them to silver. (1) Is learning to translate mathematical language the goal here? Or can we exclude that goal? This problem works well for both cases, I think. If your goal with the students is to learn to translate mathematical language, then I think that both the videos you’ve create, Dan, and the other interactive elements created by commentators are great starting points. They help students see what’s going on in the problem and provide a nice starting point. (a) Find the point on the line segment that causes the square and the circle to have the same area. (b) If we extend the line segment in both directions, are there any other points on the line segment where the square and circle will have the same area? This question asks for some geometric insight and can be answered without calculation, though finding the exact point obviously requires calculation. (c) Now find all of the points in the plane where the square and the circle have the same area. The shape of this set of points will likely be a surprise to the students. (2) What role can an animation play here? Do we want students to create an animation? I do not believe that the animation is necessary, but I don’t see any down side in the animations. 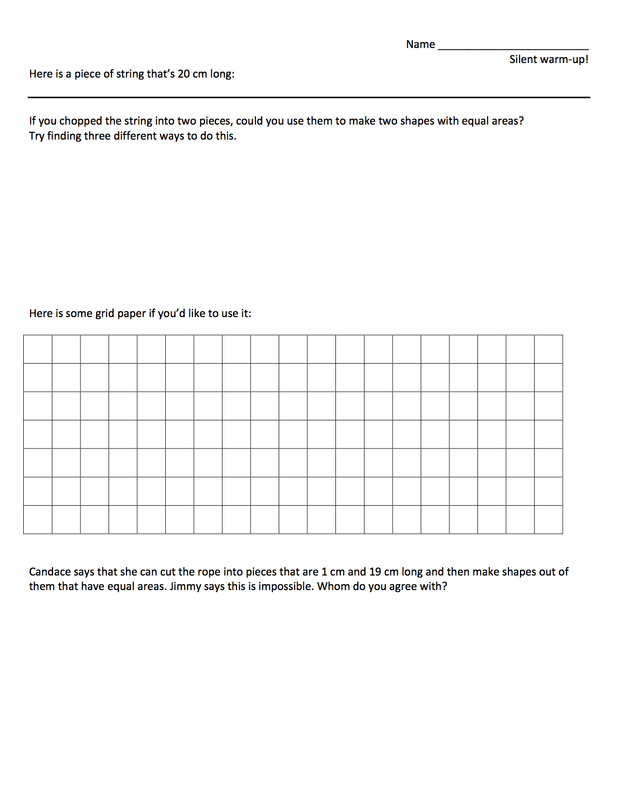 Non-animated pictures drawn by the students would also be helpful, and the suggestions of trying out the original problem with string might also be fun for students. There are many different ways to approach the problem, which is part of what makes it so interesting. (3) What kinds of scaffolds can make this task accessible without making it a mindless walk from step to step? On the other end, how can we extend this task meaningfully? My suggestion on extending the problem in the answer to question (1) probably covers most of my thoughts on this one. For me personally, when I read the problem on Tuesday morning, walking through that extension with my son was something I was really excited about. Here’s what I’m trying today. It’s working surprisingly well with my Geometry students. The Algebra students may require some formulas, we’ll see. The green fields are built in in two separate steps. But aside from that, there’s the whole problem. Also, stock photo. I’ll take that strike. New, more interesting work is a good thing. In its current form the problem asks students to translate, formulate, and solve, in that order. I’d rather move translate to the back end of the task and add new, more interesting work to the front end. Both. I’m interested in your rationale for moving from the general to the specific. That seems to make the problem less accessible rather than more, though maybe there’s something to be gained I’m not seeing. The video and the rope share a lot of features and each has features the other lacks. I like the rope (the physical one, not a picture or the word) because it places a lot of weight on making the right cut the first time. It discourages guess and check in a great way. The video also allows me to ask the sense-making question, “What do you see happening here? Put it into words.” It’s hard to ask the same question of a rope that’s sitting on your desk. I interviewed some really smart folk – Jason Dyer, Keith Devlin, and the crew from a curriculum design mailing list I frequent – and asked for their opinions on this task and my redesign. I recorded video of my interview Jason and pasted all of that in the new update. I found it extremely enlightening and I hope you do too. BTW – I think Jim’s extension of asking whether that solution to the problem is also the minimum possible area of the two shapes is pretty genius. Definitely calculus level, but it totally justifies calculus. For now, no additional information is given. This is similar to Dan’s video, but allows the students to choose their own points. Peter Boon’s comment caught my attention, in particular “imagine logo-like tools that enable students to create” well Etoys is a logo like tool that students can easily use to model this problem. I created a a blog post showing how with 3 Objects and 9 lines of tile scripting kids could easily model this problem. Etoys was designed as an educational tool for teaching children powerful ideas in compelling ways and a media-rich authoring environment and visual programming system for kids to create. So not only can it model this problem but many more Fractions, Multiplication etc. Etoys Illinois has some great resources. The first sentence of the problem makes me feel so sad for the students that have to deal with it. Problem 1: What is the radius of a circle with an area equal to a square of side X? Problem 2: What is the ratio of the perimeters of the 2 objects in Problem 1? Problem 3: If P1 + P2 = 1, what is P1 and P2? Problem 1 is the most interesting one. It is a general concept that can find many applications and will appeal to the geeks in the class. (A fun side-line is to extend it to N dimensions – for high schoolers of course). It should be solved using algebra. But the problem starts off using the language of geometry. It hides the mystery and excitement of solving a more general principle. It hides the beauty of the math behind a nuts-and-bolts problem that is poorly articulated and a problem one would never encounter in real life. As stated it is neither general nor useful!!!! Neither of theoretical nor applicable use! Translating this problem from precise to intuitive and intuitive to precise, is part of the real work that research mathematicians (and their college students) do, and not something we should always keep from our students. It’s a skill we should help them hone. To me, this problem doesn’t beg for a need to be precise in finding P, and therefore doesn’t inspire a need to pursue/develop a generalized answer. Once I can get to the point of visualizing a square in relation to a circle (like in the animations), my intuitive sense of “about equal” in area is satisfying enough. I think the important part of this problem is getting to the visualization itself, and not actually finding the precise answer. In other words, this problem doesn’t create the same need as some of your other problems presented do – I’m thinking about the water tank problem, where no one wants to sit for multiple minutes to see how long the tank is going to take to fill, therefore creating a need to develop a model. @Mike Pac – OK, but to be fair that’s just you. I mean, if approximate is OK, couldn’t just splitting the rope in half be “good enough?” After all, the area of a square and of a circle can’t be that far apart. Let’s say the rope is 48 inches long. The square will end up being 12 x 12, or 144 sq in, and the circle will end up having a circumference of 48, so a radius of about 7.64. The area of this circle is then approximately 183.4 square inches. That’s 27% bigger! But by shifting the cut just under an inch and a half (3% of the rope’s length), the areas become equal. That’s amazing to me. How does 3% = 27%? Why are the areas of a square and a circle with congruent perimeter/circumference measurements so far apart? And why is it only 3% of the rope that makes the difference? And why do so many fencelines intersect at 90º instead of being rounded? Maybe this problem in and of itself isn’t interesting, but I bet there are other approaches that could be taken to make it interesting – either to you or to your students. Sometimes giving a problem to solve just feels like same-ol same-ol. Perhaps you could give them an answer and having them find out how to get it. I just think there is *something* you can do with just about every problem to make it accessible and interesting. @Jered….Your enthusiasm for this problem is great, and I’m sure it’s infectious to your students. “Interesting” is a subjective experience. I am giving my initial impressions of the problem, and also how I think many of my students would view it. One can view “by shifting the cut just under an inch and a half (3% of the rope’s length), the areas become equal” as exciting as you do, or “oh wow, my intuition was only an inch and a half off.” I’m not saying that this problem can’t be interesting. To me, it didn’t strike the need to really dive in and explore any further. Mentioning fencing, to me and many students, also makes the problem less interesting. I’m really surprised no one has mentioned this yet (or I missed it in my skimming comments). What does that second solution mean? Pose that extension question to your Pre-calculus and above students. I have some initial thoughts, but I haven’t checked up on them with any thorough reasoning. Sorry to be so late to this confab, but so much has been great there’s not much for me to add. Two things: Dan has kindly referenced a page on my blog that talks about ways to attack the max/min version of this problem using data. if that is of any use. Which motivates the payoff question: “Depends on what?” (Followed by, HOW does it depend…”). I made a bunch of physics labs where the vague question was an essential part of the intro — enough so that I eventually got field-test students to recognize the ploy and shout, “It depends” in unison whenever they sensed one of these. This is no replacement for a really good first act. But if you don’t have one, a vague question may be a suitable substitute. I find teachers evenly split in their perception of those ill-defined questions as advantages or disadvantages in class, as features or bugs. Late to the game, but I got the idea from all the comments and the original post. I translated it, but showed the students the abstraction too. Thought the problem was fun simply to solve, but it had wonderful links to systems, transformations, and geometric relationships. I used the original question and handed it to students after they turned in a test – and just waited to see what they would do. A lot of them initially punted on it. They didn’t know how to do it and there was no help so they flipped it over and started drawing on it. After everyone finished the test I decided to try and be a teacher and scaffold a bit. I put the point right in the middle of AB and asked them if the perimeters were the same here. They said “yes”. Then I asked them if the areas were the same – and this when they made me proud and told me “no” because if the perimeters of the square and circumference were the same, then the circle would have a larger area because the circle has the largest possible area for a fixed perimeter. Thus point P had to be closer to B then A. I think that realization made them more proud that it would have if I had already provided them the visual evidence. Pingback: dy/dan » Blog Archive » Why Do You Blog: Then Vs. Now?